Prior to this commission, Griendling was living in Montana, experimenting with how two-dimensioinal graphics defines three-dimensional space. 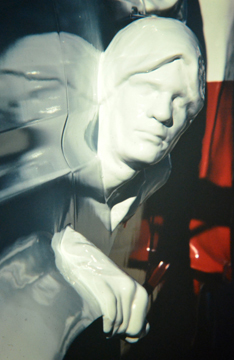 He began experimenting with the Coca-Cola logo wrapping around life-size sculptures of the human figure. When these works are viewed straight-on, the Coca-Cola logo reads flat. However, when the logo is viewed from any angle the image of the logo is distorted, which results in the visual definition of the three-dimensional space. 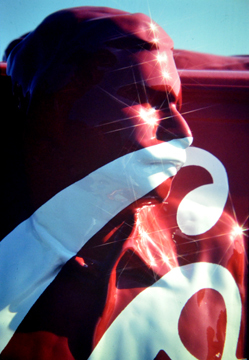 This study precipitated Griendling's proposal to The Coca-Cola Bottling Company of Elizabethtown, Kentucky to produce a "mobile" sculpture. The proposal became a funded reality and Griendling worked with 15 apprentices for a combined 4600 hours to create this moveable artwork with 18 fiberglass human figures attached to its exterior.For the record: A total of 105 square yards of fiberglass cloth was used with 21 gallons of resin, 345 square yards of plaster-gauze, 203 brushes, 410 sheets of sandpaper, 5 gallons of paint stripper and 4 1/2 gallons of paint. newspaper and television articles throughout the country.